"Even the Pictures were Plagiarized!" 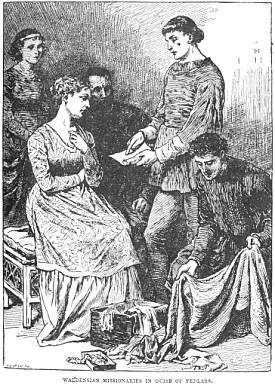 An 1886 edition of volume four of The Spirit of Prophecy contains pictures "plagiarized" from Wylie's History of Protestantism. The "original artist's signature," "Hooper SC," was replaced by Mrs. White with "Pacific Press." We first saw this accusation on the internet in 1998 at www.bible.ca. It was also posted on Dirk Anderson's site. (After we brought the following discrepancies to Dirk's attention, he immediately removed the page in question from his site.) Both of these web sites found this charge in Walter Rea's book, The White Lie. Notice that White was an experienced plagiarist and actually deleted the original artist's signature and inserted her publishing company! This is just one of many examples of artwork theft. Offenses include: replacing original signature, obliterated with black inc [sic], cut off and "Pacific Press Oakland, Cal." Added [sic]. 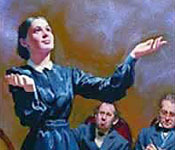 This painting summarizes the whole problem of Ellen White's plagiarism. She took the intellectual and artistic property of others and pawned it off as the work of herself and her angels. According to the White Estate, the pictures were purchased from the owner. Then, the pictures were altered to remove the artist's name, making it appear as if Pacific Press painted the picture. What a hoax! How true is the saying: A picture is worth a thousand words! At first glance, this charge indeed appears quite damaging. Why do some pictures have two signatures? [L sculpsit] he carved it, she carved it, he engraved it, she engraved it. Thus Hooper was the engraver, not the original artist, and when Pacific Press re-engraved the picture, they had every right to replace his name with theirs, for he was no longer the engraver. But then, who was the artist? Is there also a second signature on the picture in question? In the lower righthand corner opposite Hooper's name are the initials "CC." Interestingly, on page 8 of Wylie, upon the very first picture in his book, is a picture with the very same signature. "CC" was therefore the artist, and we note that Pacific Press was careful enough to include this signature in the copy that they made for Ellen White's book. When we first made this discovery in 1998, we contacted bible.ca as requested on their web site about this mistake on their web page. Obviously, when a page claims that Mrs. White removed an artist's signature, and when the facts are that the signature was retained, then a mistake has been made. We never received a reply from bible.ca, and after more than five years, their web page remains unchanged. In preparing this analysis for this site, we decided to write bible.ca once more, and have also written Dirk Anderson. To date we have received no reply from bible.ca, but we did receive a prompt reply from Dirk in which he said he was immediately pulling the page in question from his site. Reply finally received from bible.ca. Posted here. November 19 input into the matter by Walter Rea posted here. We notified Walter Rea of this discrepancy around early 2000, and anticipate that the next reprinting of his book will carry a revision of this section. According to the White Estate, the pictures were purchased from the owner. The White Estate was kind enough to fax us the documentation behind his statement, documentation he must certainly have read himself in order to make such a statement. It would appear that Rea's book is not the original source of this charge, though Rea, bible.ca, and Dirk fail to properly credit the original critic. According to the White Estate's document, this charge first surfaced in the 1930's in E. S. Ballenger's The Gathering Call. The White Estate on March 23, 1936, issued a reply. In that reply they cite a letter written on April 7, 1886, in which Willie White, Mrs. White's son, discusses the purchasing of the rights to use the pictures in question from Cassell and Company. Other letters refer to bills totalling hundreds of dollars, all concerning the rights to use such pictures in various publications. Interestingly, Willie's 1886 letter, cited in the White Estate document, points out that when he gave credit to Cassell for the use of a picture, Cassell gave him a 40% discount in price. However, as he states, for Mrs. White's book he preferred paying full price in order to omit the necessity of giving credit. The engraver's signature, not the artist's signature, was replaced in the copy appearing in Mrs. White's book. The artist's signature was retained, not replaced, in the copy found in Mrs. White's book. The right to use the artwork in question was paid for. Web pages containing this false charge should be revised to reflect the facts of the case. An unbiased and through investigation of this matter reveals a carefulness on the part of the Whites to do the right thing. This in itself suggests that they likely tried to do the right thing in other matters. It appears wise to get the White Estate's side of things before publishing or recycling criticisms. There are occasions when the criticisms are unfounded, and discovering this before publishing can save some embarrassment later on. Especially is this so when an excessive workload keeps one from correcting the errors for five years or more. What do you think about Mrs. White and the "plagiarized pictures"? It doesn't matter what the facts are, whether she paid to use the picture or not, or whether the artist's signature was retained or not. She still stole that picture. It is all right for Christians to continue spreading this charge, for the end justifies the means. Sometimes erroneous web pages take a long time to correct. The folks at bible.ca are busy, and if it takes another five years to correct the problem, don't worry about it. On at least this point, she did nothing ethically, morally, or biblically wrong.